The Blackwell Guide to Continental Philosophy is an accessible but sophisticated introduction to the most important figures in Continental philosophy in the last 200 years. 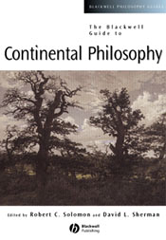 Presents a definitive introduction to the core figures and topics of continental philosophy. Contains newly commissioned essays, all of which are written by internationally distinguished scholars. Provides a solid foundation for further study. Subjects include Hegel, Schopenhauer, Kierkegaard, Marx and Marxism, Nietzsche, Husserl and Phenomenology, Heidegger, Sartre, critical theory, Habermas, Gadamer, Foucault, Derrida, postmodernism, and French feminism.